If you are in Punjab and are wondering what to take home as memento, it is likely that you have not yet visited any of its markets and malls. Indeed, the state has such a dazzling array of handicrafts that it is almost impossible to miss them. For centuries, the artisans of Punjab have been creating beautiful objects of art out of mundane day to day articles. Phulkari work, for example is typical of Punjab and so are jutties, durries, shawls, utensils, jewelries and parandies etc. Let us go into them one by one. Phulkari literally means flower work. It is an embroidery technique, traditionally used in Punjab to create wonderful pieces of art on khaddar, which is type of handloom cloth. However, today when we talk about Phulkari we mean shawls, dupattas and odhnis embroidered with specific stitches. If you are in Punjab, you must take home a few of them at least as a memento. The art is typical of this region and was prevalent even in 15th century AD. Did you know that in olden days, women of higher caste mainly used darn stitches while low caste women used cluster stitches to create the flower designs? However, other stitches such as herringbone, running, Holbein and buttonholes were also used to create special effect or to embellish the border. You may also find it intriguing that in the bygone days, as soon as a girl was born, her maternal grandmother sat down with a phulkari work, which would later become a part of the girl’s trousseau. The girl would wrap herself with it after the ritualistic bath on her wedding day. Bagh Phulkari: Bagh in English is garden. A phulkari work that covers the entire fabric is known as bagh phulkari. Since they require lot of hard work as well as patience they are quite expensive and are kept for special occasions only. Thirma: Thirma is phulkari work done on white khaddar; it is used mainly bythe elderly. Sanchi Phulkari: Sainchi Phulkari is a specialized art form made mostly in Firozpur and Bathinda districts. It generally depicts village life; designs may include everything from local fauna and flora to village scenes and even trains passing by. Some such work successfully portrays different professions such as weavers, farmers, blacksmiths and even wrestlers. Chope: Chope is that phulkari, which the girl’s maternal grandmother starts stitching as soon as she is born. In this kind of phulkari, holbein stitch is mostly used and both sides have the same type of design. Vari-da-bagh: Vari-da-bagh on the other hand is a gift to the bride from her in-laws. She is presented with one as she enters her new home. It is generally made on red or orange cloth. Darshan Dwar: Darshan Dawars on the other hand is made as an offering to God. This form of phulkari is typical of Indian Punjab and along with floral patterns the designs may also include human beings and animals. Bawan Bagh: It is made by using fifty two different kinds of designs. Panchranga Bagh: Panchranga Baghs are created using five different colors. There are also satranga bagh, which uses seven colors. It is to be remembered that to a Punjabi family, phulkari is more than a fashion statement. It is a way of life that has profound social impact. Therefore, when you buy a phulkari work as a keepsake, remember that you are actually taking home a part of Punjab’s heritage. At the same time, it is important to understand that the art was originally created for the use of the family members only, not for profit. Today, however, they are being mass produced for commercial purpose. Therefore, it is very important to examine each piece carefully so that you get the best value for your money. The third point to remember is that phulkari work is now available on every conceivable item and they include everything from clothing items to bedspreads and jutties. Therefore, it is important that you should keep your eyes open. Jutties are another unique item of Punjab. Unlike usual shoes they are always made by hand and embellished with different materials such as beads, small glasses, artificial pearls and sea shells However, majority of them are intricately embroidered. Among the later group, phulkari jutties are highly appreciated by the connoisseurs. These jutties go well with ethnic dresses and are worn mostly as party wear or for attending traditional ceremonies. If you are in Punjab and want to pick up something ethnic, you must buy at least one pair of Punjabi jutties. Since they come in all colors as well as materials, you will have a wide choice. Durries are another specialty of Punjab. In essence, they are handmade rugs woven by village women with the help of a comb like iron fork known as panja. They were initially used for sitting on the floor. Today however, many of them are also used as bedspreads. Indeed, these durries are as much functional as they are decorative and in Punjab they are used as much as room décor as for sitting on the floor during religious as well as social functions. Durries come in different colors and designs. Although many of them come in traditional stripes, geometric patterns are equally popular. Now, of course, stylized figures of human beings, birds and animals are also woven as motifs. Why Should Anyone Buy a Durry? Durries look so good and yet are so functional. A cleverly chosen durry is enough to transform the whole décor of the room. Secondly, these durries are light in weight and hence easily movable. They are also easy to clean. Pricewise too they are far cheaper than carpets. Therefore, if you are in Punjab, you must look for one. You never know when they may come handy. Although Amritsar, Hoshiarpur, Jalandhar, Nikodar, Anadpur Sahib and Mani Majra are the main places where these durries are manufactured, they are available all over the state. Punjab is also very famous for its shawls. They are beautiful, intricately designed and yet reasonably priced. However, there are varieties of them and the price depends as much on the material used as on the work done. Amritsar, Ludhiana and Jalandhar are the main centers where these shawls are made, but they are available all over state. As we have already said, shawls in Punjab come in variety of materials such as pure wool, pashmina, cashmillon, angora etc. Among them, pashmina shawls in Punjab are made from the hair of pashmina goats, locally known as changthangi. These changthangi goats are a special breed of goat found in the upper ridges of Himalayas. However, pure pashmina wool is rather delicate and open weave; so they cannot tolerate tension. That is why many shawl manufacturers in Punjab blend either silk yarn or pure wool with pashmina yarn to create a tougher and more affordable shawl. If you are looking for such blended pashmina shawl make sure that it has at least 70% pashmina yarn. Some also go for 50-50 blend. Jamavar shawl made with pashmina yarn is truly a good buy. Such shawls have designs woven all over the surface and consequently, they look really gorgeous. However, shawls made from pure sheep wool are by far more popular. They are warm and come in varied designs. Try the Jacquard shawl; they have raised designs woven into the fabric. Phulkari shawls too have become very popular. Besides, if you look for them, you will also find shawls made from yak wool. They also look very elegant. However, if you are looking for something more affordable, try cashmillon shawls. These are made up of acrylic yarns; but are very soft and comfortable. On top of that, they require very little upkeep and so can be used at random. You can find all kinds of designs in them and so they are also good buy. Wood work of Punjab is another favorite item. Beds with carved legs and designed backrests may be too big an item to take home; but you can always pick up a traditional preera. It is a low comfortable seat almost akin to a very very small table. You can also look for pidhis; these are small stools with intricate designs carved on them. In addition, you can also look for small wooden items such as decorative boxes, chessboards, mirror frames, table legs, toys etc. Most of these items are not only intricately carved, but are adorned with mirrors and given lacquer finish. The main centers for this trade are Patiala, Amritsar, Kartarpur, Jalandhar, Bhera and Hoshiarpur. However, the products are available all over Punjab. If you, on the other hand, are looking for something ethnic but small, there are the parandas. These are intricately woven silk threads that the Punjabi women tie at the end of their plaits. Today, women of other regions have also started showing interest in them. Parandas, also known as parandis, come in all kinds of shapes, designs and colors. They are bright and beautiful; what is more, they reflect the spontaneity of Punjabi culture. Rural women in Amritsar, Jalandhar, Hoshiarpur, Nikodar and Ludhiana are mainly engaged in this trade and that is why when you present someone with a couple of parandas, you are actually offering them a glimpse into the tradition and culture of Punjab. Toy making industry in Punjab goes back to the Indus Valley Civilization Era. Folk toys of Punjab reflect the social fabrics of the state and are collected by many not only as toys for children but also as decorative pieces. Basketry too is an ancient art of Punjab. Although they were initially started as a means for making household goods, today they have been turned into a work of art. Apart from usual baskets, containers and mats, artisans in Punjab make a kind of hand fans known as Peshwari Pakkhe that is truly unique. There is also the kunda ladar pakkhi; these too are fans, but much smaller in size. You can also look or them. Pottery and papier mache utensils are two more items to look into. Indeed, the state produces beautiful storage containers out of paper pulp. You will be ill-advised to ignore them. Jewelry making is also an art here. Besides, Punjab is famous for its leather garment as well as sports goods. If you are interested in them do look for them in the numerous malls and markets lying across the state. Indeed, in Punjab, where to buy is the least of the worry. Each and every town has numerous shopping malls and markets from where you can make your purchases. You only need time to go through the array of wonderful merchandise and then make intelligent choice Besides, there are many handcraft emporiums that you may also visit. It seems each and every town in Punjab has one or two shopping malls. While it is true that many of these malls are located in the newly developed cities like state capital Chandigarh and adjoining Ajitgarh ancient towns such as Amritsar, Patiala, Jalandhar, Ludhiana and Bathinda too have fair share of them. For example, Amritsar has more than twenty mega shopping malls and marts where you can shop in comfort. If you ever go there do not forget to visit Trilium Mall on Circular Road. It has array of shops spread over five acres of land. Also try to visit Alpha One and Celebration Mall; they too have many shops selling all kinds of branded as well as non-branded products. If you visit Bathinda, do not forget to visit Peninsula Mall. While the City Center is the first shopping mall in this town Peninsula Mall, spread over an area of 2,50,000 sq ft, is by far the largest. While in Ludhiana, you must visit Westend Mall at least ones; it is said to be the most luxurious mall in town while Omaxe Plaza, spread over an area of 1,50,000 sq ft is said to be the most conveniently located. In Pathankot too, Novelty Mall and City Centre Mall have now become the popular shopping destination. Other than shopping malls, each city in Punjab has well developed markets. Sector 17 in Chandigarh is a shopper’s delight. However, Curio High Street Market in Jalandhar is also another of the not-to-miss places in Punjab. It has been built on the format of European retail places. It not only has separate sections earmarked for different sectors such as multiplex cinemas, hypermarkets, anchor stores, food courts but also has 50% green cover. Patiala too is famous for its markets. If you have a wedding at home Adalat Bazaar is the place to head for. It is famous for its typical Punjabi bridal collections. Then there is an Achar Bazaar, which specializes on pickles. You may click here for more information markets in Patiala. Chhoti Baradari in Patiala is famous for its handicraft shops. 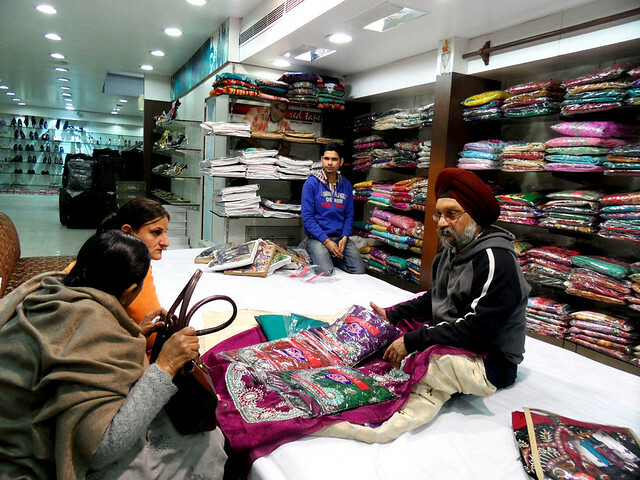 Along with other private enterprises, this market also houses Phulkari Emporium owned by Government of Punjab. However, these Emporiums are located in other cities as well. Sector 17 of Chandigarh also houses one of them and so do Amritsar, Jalandhar and Ludhiana. You are sure to get the genuine products if you visit any one of them.